Cassandra Clare’s City of Bones is a riveting story that I couldn’t put down, and didn’t want to put down! From page one, I was completely ensnared. There was just something in the way Clare set up the opening for us that leaves the air thick with tension, and the reader saying, “Okay, something is going to go down.” I swear, I can’t pinpoint exactly what it was that had me so captivated. This is just one of those books that you either absolutely fall over loving, or you puke your guts out hating. I fell hard. CITY OF BONES begins in a club in New York named Pandemonium. There we meet Clary, short for Clarissa, and her best friend Simon. Clary is witness to a brutal murder, although she seems to be the only one who CAN see this killing out of an entire club packed with sweating dancers. This event is a catalyst that sends her life spiraling into a territory she never knew existed, and she will be surprised to find she is a major part of it. I thought that the pacing of the novel was amazing. It created an action-y atmosphere, while of course throwing romance and teetering friendships into the mix. I know, I’ve been reduced to a fan girl. Jace was (of course) my favorite character. I’m a total bad boy lover, and Jace’s sarcastic wit and humor, as well as all-around badassness just made him irresistible. I actually loved all the characters. 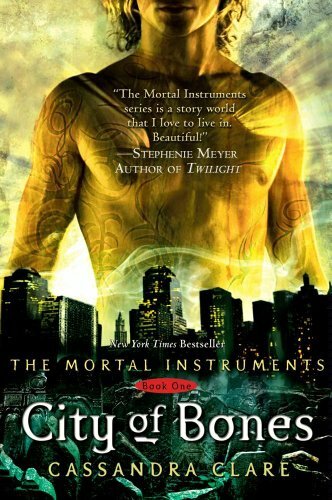 Yes, yes I know this is a gushing review, but to be honest, City of Bones is absolutely one of my favorite books. It’s one of those books that you don’t come by very often, and that you didn’t really have any issues with after reading it. Truly, this is a very rare occurrence with me, as I’m a rather large snob when it comes to novels, but I loved CoB. Anyone who picks up CITY OF BONES is in for a thrill ride, jam packed with obstacles and impossibilities galore. Clare creates a delectable tale full of twists and turns that even J.K. Rowling would be envious of. And, seriously, that cover. Yum. I give this novel 5 out of 5 stars. Hi :D thanks for your comment :). Oh you're learning french? :p Have you ever been in France? And where do you come from exactly? Oooooh I LOVE Cassandra Clare :D. I love The Mortal Instruments (totally in love with Jace <3) & I've just finished the first book of her prequel : The Clockwork Angel and it's really good. Happy reading and have a good week :). I picked up the prequel, Clockwork Angel, a few weeks ago, it's excellent also.